Create customized EDITABLE NAME BOOKS for your students to use as a resource to LEARN THEIR NAMES or LAST NAMES! 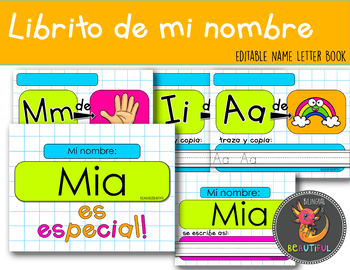 Enter your children's names in the Text boxes and edit "Mi nombre EMPIEZA con:" or "Mi nombre TIENE LA LETRA:" and choose the sounds in the student's name. It is super quick and easy for you to create a set for each student in your class. My personal preference is to print, LAMINATE(so that students can use dry-erase markers and keep practicing), and bind. ★ You must be able to open and edit this product in PowerPoint. ★ This resource will be delivered in a ZIP FILE. Be sure you know how to open/extract the file before purchasing. ★ Slides have been flattened in the document. Editable Text boxes use CENTURY GOTHIC font but can be changed-so you do not need to install anything special. ★ The name books will accommodate names with as many letters as needed. Simply edit and print the cover, letters you need, and the last page. ★ If you have questions about this product, please use the Q&A tab above before purchasing.